In an interview with Al-Monitor, journalist Tomer Avital talks about his social-journalistic Internet enterprise titled “One hundred days of transparency,” with the goal of subjecting elected officials to new standards of transparency. Journalist Tomer Avital at the Knesset plaza in Jerusalem, in this undated 2014 photo. Israeli journalist Tomer Avital received a 1 ½-hour tape recording made at a closed political meeting in October with former Communications and Welfare Services Minister Moshe Kahlon. The former minister is heard in the recording talking rather freely on what is going on behind the scenes of Israel’s leadership, and explaining how the ''give-and-take'' mechanism between senior politicians and politico wheeler-dealers actually works. Kahlon further described the pressures that were exerted on him at the time, to stop the successful cellular reform that he had initiated. Inter alia, he received a phone call from a senior army officer, warning him that opening the cellular market to competition would be detrimental to the air defense Iron Dome project. Avital gave publicity to the tape recording in his blog, and the story made waves in the mainstream media, too. Avital is a freelance journalist — a “journalist on behalf of the public,” as he puts it. He used to cover the Israeli parliament for the daily Calcalist. In that capacity, he exposed in February 2013 the "pistachio ice cream” scandal concerning the premier's expenditure bills, which involved the prime minister and his wife. In July, Avital started a social-journalistic Internet enterprise under the heading “One hundred days of transparency.” His goal is straightforward: “To subject the elected public officials to different and new standards of public transparency.” Avital has to his credit a number of other achievements, in addition to exposing the Kahlon tape recording. Among other things, Avital has drawn public attention to the specific timing chosen by former Interior Minister Gideon Saar to hand in his notice, which allowed him to maximize his retirement allowance. Other scandals that came to light thanks to Avital include his report on the numerous trips abroad of Labor Knesset member Nachman Shai, and his disclosure concerning the frequent absence from parliamentary meetings of the two Kadima Knesset members. So far, Avital has raised some 159,000 Israeli shekels (about $41,350) through crowdsourcing, via the Headstart website. He pledged to use the money to collect information on politicians — for instance by recruiting private investigators — to expose their conduct in arenas that are not visible to the public and that are thus liable in enabling improper activities contrary to the public interest. As a journalist using unconventional methods, Avital has become in recent weeks quite a nuisance for local politicians. Speaker of the Knesset Yuli Edelstein has even gone as far as to announce that he will ban Avital and his associates in the transparency initiative from entering the Knesset building. Avital, for his part, is running the enterprise from Tel Aviv cafes, using the funds he has raised, a laptop, a mobile phone and more than a hundred volunteers. To make ends meet, Avital writes for several newspapers, tapping his savings for food and living modestly, sharing a rented flat with two roommates. Yet, professionally, he feels rewarded more than ever. To a large extent, Avital’s transparency initiative is a continuation of the social justice protest of the summer of 2011. Al-Monitor: Do you think traditional journalism by itself will not be enough, to address the problem of lack of transparency? Avital: Most journalists would rather not sit through [parliamentary] committee meetings. They prefer to meet directly with Knesset members, and more often than not, they come up with mere political gossip. It is most interesting to know why and when Gideon Saar resigned from office. However, it is even more interesting and no less important to understand that he timed his resignation so as to boost his retirement allowance by another 42,000 shekels [about $11,000]. As a journalist, I dug into government websites, which journalists tend to shun, and that way, I exposed the ice cream scandal. When I was working in the Knesset, I mapped out a number of settings, especially in the Knesset committees, where the lack of transparency really bothered me. It is in these venues that bills are discussed and formulated, and where everything is determined. However, committee votes are not recorded in the minutes. In other words, there is no accountability on the part of Knesset members, and this is where it is most needed. I was deeply concerned over these practices. 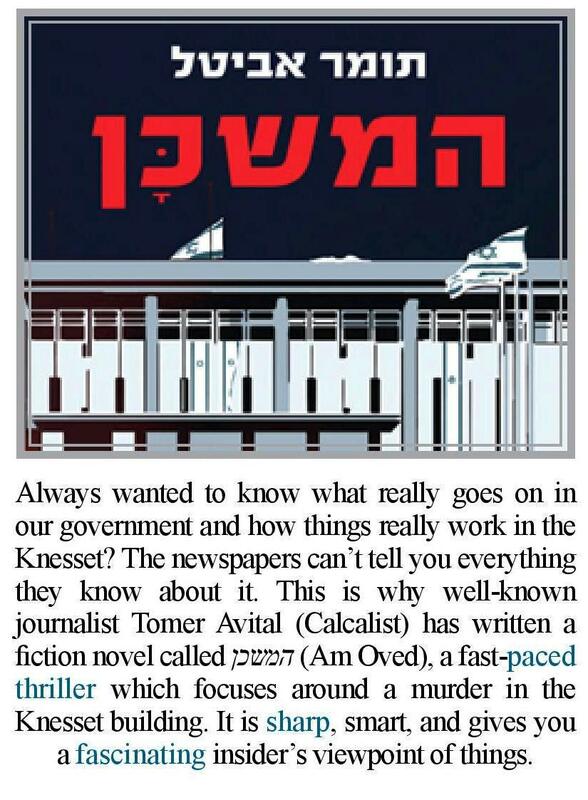 And that’s why I decided to write a thriller about the Knesset, and thus tell how the method works and what is really going on in the Knesset corridors and its committees. The story begins with a murder and a body, and like any good thriller, it features quite a few murder suspects. One of them is [none other than] the Knesset speaker. At first, I found it hard to find a motive for him, and then I came up with an idea: Let’s portray him as a shareholder in a company involved in some stock scandal. But it then occurred to me that it did not make sense, since, surely, Knesset members were barred from investing in shares. However, looking into the matter, I found to my astonishment that unless you hold a ministerial post, you are allowed to hold shares. In the United States, for instance, the stock portfolio of all elected officials is visible to the public on the Internet. Al-Monitor: And has the book achieved its goal? Avital: Not really. The book, titled "The Knesset," was eventually published, but I failed to put the spotlight on the lack of transparency. By the way, the issue of the shares kept bothering me, and I thus approached Meretz Knesset member Ilan Gilon on the matter. We then pooled resources and formulated a bill that requires transparency on the part of the Knesset Finance Committee members with respect to their stock portfolio. However, the coalition leaders shot down the bill. And that was my breaking point. I realized that the Knesset members were not representing us. They are representing their own interests. It was then that I started to develop the transparency enterprise. I thought that if I appealed to the public to invest on behalf of public transparency, it could work. As a matter of fact, I told the public, "You are going to fund investigations; you are going to be my employers." Just five days before Operation Protective Edge began [on July 8], I had turned to the public on Facebook, listing all those instances where Knesset members had an opportunity to enact transparency laws, and where they dropped it. I promised to use the funds raised to hire investigative reporters and private investigators, who would enforce transparency on anyone dropping the proposed transparency laws. That is, we aim to target all those shady Knesset members, and one of the challenges we face is the exposure of the schedule of elected public officials, kept out of sight. If we have investigators at our disposal, we will be able to follow problematic politicians holding meetings in public places. I even presented data showing that Israel was the leading country in the West in terms of the number of absences from the Knesset plenum. However, Operation Protective Edge was then launched, and the enterprise was suspended. As it turns out, the war has not harmed the initiative. Actually, this has shown me that people believe in my enterprise. My volunteers, some of them high school students, help me to rate the Knesset members on the "shady MKs' scale" that I have defined according to a number of criteria. Thus, for instance, we check which Knesset members voted against the shares law, and examine their record of presence in the Knesset meetings. Have they complied with the requirement for the submission of statements of capital? Have they declined comment on legitimate journalistic queries? That’s how we defined our bank of targets. We want transparency defaulters to sweat. Al-Monitor: How do you get hold of the information? Avital: I meet with Knesset members who provide information on political rivals. They realize that I can verify the information using my investigation funds. Parliamentary aides, consultants and lobbyists also provide information. Al-Monitor: To what extent does your enterprise have to do with the social justice protest that erupted in the summer of 2011? Avital: My enterprise has evolved out of the protest, which is the engine that started everything that is going on now. Sixteen-hundred people volunteered to donate money to give transparency a chance, and to support my enterprise. It shows that the protest is still alive and kicking, and that people persist in their efforts to bring about a change. I have received phone calls from people who told me, "We have never donated on behalf of any cause, but now, we have donated to your enterprise." They asked me not to let up.